We​ ​can​ ​clean​ ​cladding,​ ​fascias​ ​and​ ​soffits​ ​in​ Kirkcaldy,​ ​Fife..​ ​We​ ​are​ ​able​ ​to​ ​restore​ ​and​ ​clean​ ​all​ ​building​ ​materials​ ​and​ ​surfaces​ ​such​ ​as​ ​UPVC,​ ​plastic,​​timber,​ ​cladding​ ​and​ ​metal.​ ​Our​ ​house​ ​exterior​ ​and​ ​cladding​ ​cleaning​ ​is​ ​available​ ​beyond​ ​and​ ​across​ ​the​ ​Fife​ ​area​ ​including​ ​towns​ ​such​ ​as​ Kirkcaldy, ​Dunfermline,​ ​Glenrothes​ ​and​ ​Cowdenbeath. Many customers come to Fife Window Cleaning Services to increase the presentation of their uPVC, cladding or fascias. An exterior clean of this sort, is one of the most dramatic and noticeable improvements we can make to your home. We know that curb appeal matters, and also to potential buyers of your home. The following article by Forbes lists general cleaning of the home as the number one must have; for preparing to sell - READ THE ARTICLE HERE. We can bring your home exterior up to a level that isn’t only impressive to a buyer as they walk up the driveway for the first time, but that also helps create a nice place to live for you. Fife Window Cleaning Services will firstly assess the surface that requires treated; whether there are any plants or animals nearby, and then come up with a suitable process to safely clean the area. We find for most uPVC cleans that our van mounted window cleaning system is perfect. This system has the ability to produce continuous and adjustable hot water, and clearly hot water is a great cleaning agent in itself. When using this system we agitate all areas first and with telescopic industry specific poles; and leave a dwelling time prior to finally rinsing surfaces clean. We understand that biological agents such as pollen and Uv light can dull uPVC and fascia. When dealing with stains rather than just dirt, we will use safe and effective chemicals to treat such surfaces. The chemicals are scrubbed onto the affected areas and these chemicals are rich in natural glycerine; meaning the likes of closely located window seals will not perish with what we use. The properties of our chemicals have a restorative affect, and you will be sure to notice an added post clean shine. Fife Window Cleaning Service can improve your business’ exterior presentation. Locally it is noticeable to us that while many business’ have window cleaning contractors in place, the actual signage is often neglected; yet this is the first thing clients and customers will see as they enter the building. We have the equipment to offer a service that can clean signage many levels above ground. 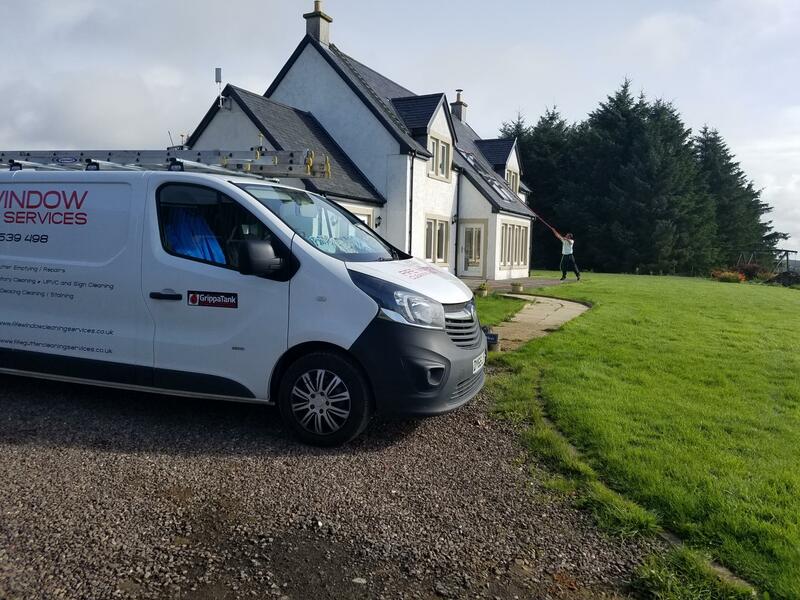 Our other outdoor cleaning services include commercial window cleaning in Fife, a variety of driveway and patio cleaning services and also conservatory cleaning in Kirkcaldy and Fife. Call now on 07856 539498 or simply fill in our online contact form for a quotation.